Polenta with chanterelles 400 gr. Polenta with chanterelles - tradition from the Dolomites, eating-ready, already salted. Gastronomic speciality on the basis of cornmeal and additions. Bring 1.9 Litres of water bring to the boiling. The packet contents slowly sprinkle into the water and mix with the whisk. Allow to cook under occasional stirring 4 minutes. Serve with cold-pressed olive oil or butter. Warmed up with butter or oil in the frying pan the polenta is also very tasty. Buy now this product together with Polenta with Porcini 400 gr. 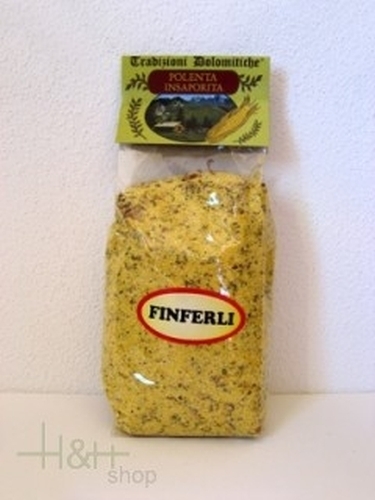 ready for shipment: in stock Polenta with Porcini 400 gr.